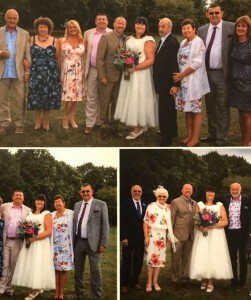 About A Bride has been trading for 20 years, we were the first ever plus size only shop. During which time we have enjoyed finding thousands of curvy Brides their dream dress. After trading in Stony Stratford for many years. In August 2009 we moved to more modern premises. In Fenny Stratford not far from Central Milton Keynes. We are also 10 minutes from Ikea if you want to make a day of it. We are now well known in Fenny Stratford for our Window displays, with passers by dropping in or phoning to tell us how lovely the shop looks. Barbara has always worked in the Wedding Industry, first as a Florist on leaving school. Then creating About A Bride Plus Size for all the curvy Brides that couldn't find a dress anywhere else. It has always been her aim to provide beautiful Dresses in modern styles to suit the fuller figure. 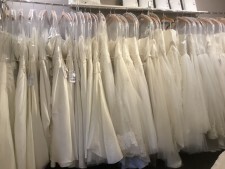 With over 140 Wedding dresses to choose from to suit all budgets, the plus size Bride always loves the vast choice available. We are always aware that you only get one chance to make sure everything is perfect for the special day. So we will go the extra mile as our kind reviews show. Always the shops attitude is to make every Bride feel comfortable, special and listened to. Your Wedding dress is the most important dress you will ever buy. And your bridesmaids and Flowergirls are not forgotten about, our adult dresses start at size 6 up to any size you need. And we carry a vast range of Flowergirl dresses. new babies to show us. Our testimonials certainly show we are doing something right!